This is the way many of my cooking inspirations start. I take a manageable menu and decide to make one more dish. As it turned out, the whole menu was manageable and the soup was really quite good. I have a new thing to make! You can make it, too. First, the shrimp stock. The recipe makes about 8 cups. 4 tablespoons tomato paste (or 1/2 cup of tomato sauce): Note: I substituted 3 tablespoons of sun-dried tomatoes packed in oil and about 1tablespoon of Sriracha sauce. 12 cups of water, or to cover. Saute shrimp shells in olive oil in a stock pot. Stir and cook for about 10 minutes. Add all remaining ingredients except water and salt. Continue cooking, stirring frequently, over medium heat, for about 10 minutes. Add water and deglaze the bottom of the pan by scraping the browned bits (the fond) with a spoon, and combining them with the rest of the stock ingredients. Bring to boil, reduce heat, cover and simmer for 20 minutes. Strain stock with a colander set over a large bowl or pan. Add salt to taste. Use immediately, refrigerate, or freeze. Here’s my stock, right before I strained it. Look at the color! 4 pounds of clams, in their shells, rinsed with cold water. Saute onion in olive oil over medium heat. Cook until translucent or if you prefer, until they brown. Add garlic and cook for another minute or two. Add shrimp stock and deglaze onion and garlic bits from the bottom of the stock pot. Add canned tomatoes, sun dried tomatoes, and potatoes. Bring to a slow boil. Cook until potatoes are tender. Adjust seasoning with salt and pepper. Lower heat, add clams, and cover the pot. Cook, checking every couple of minutes until clam shells open. Ladle the soup into bowls and garnish with parsley. I love making fruit pies. Actually, I love eating pies. And the quality of the crust is crucial. The wheat allergy thing has put a crimp in my pie dough making ways. Not only can I no longer eat it but I can tell that it is affecting the quality of the wheat flour pies I make for my family. Pastry making is not as forgiving as other kinds of cooking. The moisture content of flour can vary, the amount of humidity in the kitchen varies, and there are always little variations in measuring, depending on settling. I’ve relied on the “feel” of the dough while I am handling it as well as the texture of the dough when I cut into the pie after I slice it. This is helpful but not the same kind of feedback I get when I actually eat the pie. And don’t get me started on the moisture content of the fruit filling and what it does to the crust! I have also been working with gluten free pie crust recipes. Here’s the thing, gluten does wonderful things to pie dough. Even so, I don’t like most wheat flour pie dough recipes! I also don’t like most of the crusts on the pies I eat. I had settled on a recipe a number of years ago and it had been a solid winner. Working with gluten free dough was almost like learning from square one. First, the dough is really brittle. It breaks easily. It has almost no elasticity. My first attempts were rather sad looking. Now if they had TASTED good, that would have been okay. But the first doughs cooked up like brick. Okay, I am not being entirely accurate. Actually, they tasted like bricks with delicious fruit topping. Last October, I thought I was getting close. This week I did some more tinkering and I am happy to say that I liked the pie! You might think that I’ve put an awful lot of work and emotional energy into this. You’re probably right. It’s a little win to offset the inconvenience of my gluten free lifestyle. I have come to the conclusion in the last couple of months that the only way to manage the skin problems caused by my wheat allergy, is to avoid eating any food that I have not prepared myself. Think about what this means. Not fun. But here you go, the much promised pie dough recipe!!! 1. Mix 1 cup of the flour blend with ½ cup canola oil. Combine with a fork until well blended. 2. Heat butter in small saucepan on low until it’s nicely browned. (You can tell because it changes to a brown color and gives off an amazingly yummy fragrance). 3. Add the browned butter to the flour/oil mixture and combine. Put the bowl containing this mixture into the freezer for 20-30 minutes. 4. Combine the remaining 1 ¼ cup of flour with the sugar, xanthan gum, salt, baking soda, and baking powder. Add it to the semi-frozen mixture and cut it with a pastry blender until it is the consistency of coarsely ground cornmeal mixed with some bigger lumps, up to the size of a small pea. 6. Divide the ball into two parts. Roll each part between two sheets of waxed paper and use for one double crust or two single crust pies. 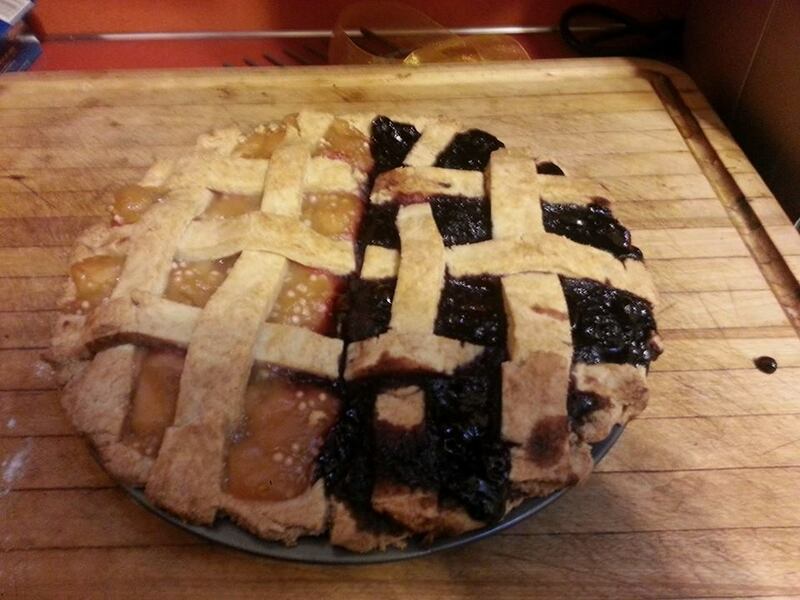 Note: I made a lattice crust this time but it broke a lot while I was making it. It is much easier to roll out a single crust for the top. I come from an Italian American family on my mother’s side. Her great grandparents were farmers in northern Italy who immigrated to the U.S. to raise children and work the coal mines near Seattle. In other words, they were not fancy people. They were poor. But they were smart, hard working, life loving, and resourceful. They not only loved food but had a lot of mouths to fill. They knew how to “make something out of nothing”. My mom knew how to do this, too. It wasn’t as if we were poor but money was tight and there were a lot of people to feed in a family of eight. Mom is also masterful at re-purposing leftovers into new meals so that food is not wasted. The week has continued to exhaust me. I rallied in the writing of my last post, only to have an extremely fragmented and stressful evening, during which my irritability peaked, and I became quite irrational. My daughter had gotten rather angry with me because she told me that she had another parade the next morning and I had reminded her that I had asked her to tell me about all of her events and she had just told me, “Don’t worry about it, Mom.” I was not able to sacrifice half of a work day to get her there. She got very angry. It was kind of a last straw for me and I mostly took it out on my husband because she had treated me extremely disrespectfully and he left the room instead of backing me up. Realistically, he was probably doing what he needed to do to keep from yelling, with which I was already doing a good job. I spent a good deal of the early part of yesterday fighting the urge to go back to bed. I have not had a day like this in a very long time. My brain and my heart were utterly exhausted despite the fact that it was a gloriously beautiful summer day in which I had much to do. I forced myself to stay out of bed. By late afternoon, I was sitting on the couch with a head both full of everything and nothing, swirling in eddies of acute pain and numbness. I walked into my kitchen. I had a perfectly ripe mango, a perfectly ripe avocado, and some limes. They were not planned for a particular meal. In general, that is often the way I shop. I just buy what looks good. In my freezer, I had some large shrimp. I also had a bit of simple salad left over from another meal. It was made from jicama, radish, and lime. I thought that might be a nice textural and flavor contrast with sweet mango but I wasn’t sure but I started getting excited to try. And as I sliced, zested, crushed, sauteed, and mixed, my spirit continued to lighten and I felt myself filling up again. When I tasted, I could tell that I’d made a lovely summer salad full of good things. My husband and I had a nice meal together, which led to a nice evening. I had been depleted and feeling in utter need, just an hour before. I needed to give myself an experience of creating from start to finish, to remember that I am capable of making wholes and not just carrying an armload of loose fragments, which keep falling to the ground, and then others fall as I stoop over to pick them up. Remember what you have and make use of it. That is my meditation for today. 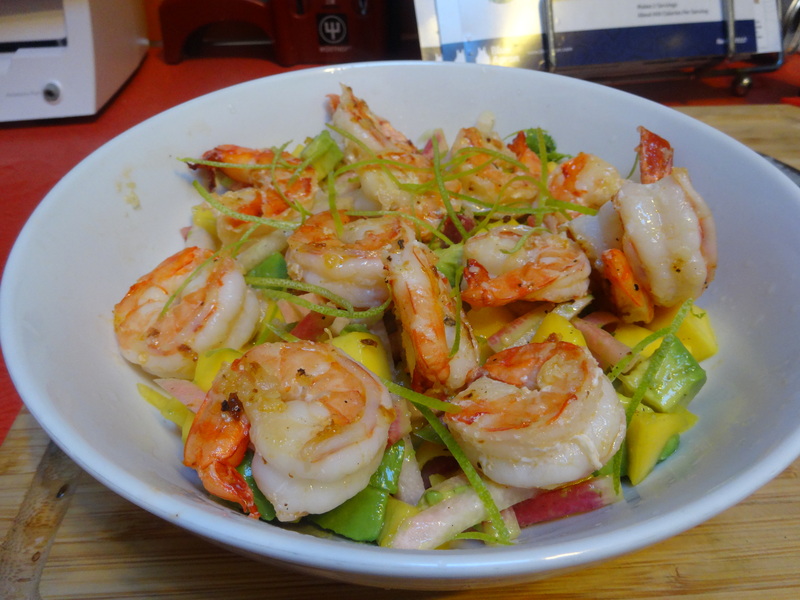 Shrimp and mango with lime, garlic, avocado, radish, and jicama. About 1 pound of large shrimp, peeled and deveined with tails left on. 1 lime, zested (put zest to the side), then cut into quarters. 1 large ripe avocado, peeled, pitted, and cut into large dice. (Squeeze one of the limb slices on it so it doesn’t discolor). 1/4 of a jicama, peeled and cut into matchsticks. 3 cloves of garlic, peeled and crushed. 1. Put all of the ingredients into a bowl except for the shrimp, garlic, half of the lime zest, and all of lime wedges into a bowl. Add salt and pepper to taste and the juice from 2-3 lime wedges. Mix gently with your hands so the avocado does not lose its shape. 2. Heat 1 teaspoon of oil and about 2 teaspoons of butter in a large saute pan, on medium to medium high, taking care not to burn the butter. Add garlic and cook for about a minute, stirring frequently. Add the shrimp and cook for a minute or two on each side until curled up and opaque, but not rubbery! 3. Put the salad into a serving bowl and top with the shrimp. Sprinkle the remaining lime zest on the top so it looks pretty! I’ve discovered another way of getting my naturopath recommended 2 tablespoons of flax seed meal each day. It’s so simple. I can’t believe I hadn’t thought of it sooner. I combined one heaping tablespoon of peanut butter with two tablespoons of flax seed meal. I spread this mixture on two apple halves. Although the flaxseeds change the texture of the peanut butter, it’s still pretty tasty. 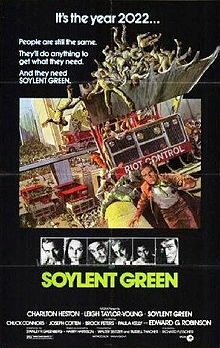 Soylent Green, it’s chia, it’s chia!! Okay, this post is not really about the versatility of the chia seed, although I can think of five uses for it off of the top of my head. Prior to becoming a cancer patient, I could only think of two, the original “Chia Pet” and the take off from Saturday Night Live, when they had Kevin Nealon plant chia seeds on his head to replace hair loss. The I suspect not-so-cranky, Cranky of “Grandma Says” has nominated me for the Versatile Blogger Award. Thanks, Not-So-Cranky! Many of you out there are familiar with these nominations. The nomination is the award and the process works likes the kindest chain letter you will ever receive! The rules are to post the graphic of the award, for me to tell some random facts about myself, and to nominate 15 other blogs for the award. As you may also know, I try to follow the spirit rather than the letter of the law when it comes to these awards, though this time I actually posted the graphic. It’s very easy. I’m not sure why I haven’t done it previously. As for the random facts, I did that once but at this point, how many more factoids can I really give you and have them be a surprise? I guess I will give it a try but just one fact. I need to save some material for future blog posts. 1) I love autobiographies and read about all kinds of people, from Malcom X, to gardeners, to chefs, to musicians, to world travelers, to actors, to comedians, to the understudy for Elphaba in Wicked, to RuPaul. People, I even read Andre Agassi’s autobiography and I’m not even a tennis fan. And by the way, it’s a pretty absorbing read. As you know, I changed my diet to improve my general health as well as to eat things that are linked to a reduced risk of cancer. I have also extended my health practices beyond traditional medicine. I like to use as many sources as I can. I see the usual suspects, onco surgeon, medical oncologist, internist, but I also see a licensed massage therapist, psychologist, and a naturopathic physician who is certified in cancer treatment. I am about to embark on a journey to Chinese medicine. I am particularly interested in acupuncture. My most immediate concern is doing something about my stupid hot flashes. I also know that there are other potential positive applications of acupuncture to be explored. First, my own philosophy fits more into the “integrative” model than “alternative” model. Integrative healthcare is inclusive. Even mainstream Western medicine is getting increasingly integrated. At the Swedish Cancer Institute, there are naturopaths and licensed massage therapists. There are classes on mindfulness meditation and diet. I am also glad that more non-traditional therapies are being researched using western research strategies. I very much respect that there are other ways of supporting the efficacy of a treatment. Practitioners of Chinese medicine, for example, often point to thousands of years of accumulated clinical evidence. However, the investigative tools that I have at my disposal for evaluating potential treatments are western based. In other words, I am in a better position to critically evaluate research articles than to evaluate evidence gleaned through other methods. I don’t think any reputable healthcare provider is going to discourage patients from being careful about how they treat their bodies, especially cancer patients. There are people who prey on cancer patients. There are also good hearted people who do not have the skills or expertise to responsibly provide healthcare advice but they do so, nonetheless. I am very leery of folks who think something is harmless just because it is “natural” or because it is delivered by a non-traditional provider, who must be superior to a traditional provider because the latter group are bad. I would like to re-introduce you to my friend, Michael Ishii, of Stonewell Acupuncture. He practices Chinese medicine in New York City. He also writes an informative health blog. Some of his posts are recipes, one of which, I’ve cut and pasted below for a nutritious gluten-free chia dessert. See, I told you that the chia seed figured in this post. Chia is also used in some gluten-free bread recipes as an alternative dough binder to xanthum or guar gums. I have not yet tried this out but plan to once I used up my “economy” (“economy” being relative as gluten-free ingredients tend to be pricey) sized bag of xanthum gum. 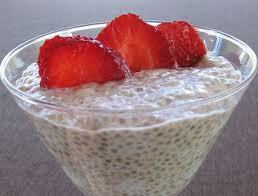 Vegan Chia Pudding: Delicious Super Healthy Treat! OK, remember the Chia Pet TV commericals? Who would have thought that Chia seeds would be a superfood? Or so delicious! Chia is a plant that is native to Mexico and Central America. It was cultivated by both the Aztecs and the Mayans who highly valued this food, and the word “Chia” actually means “strength” in Mayan. Chia seeds are a source of complete proteins, they are loaded with omega 3 fatty acids, are rich in calcium, are a terrific source of anti-oxidants and have a low glycemic sugar index. The seeds, when soaked in a liquid, swell up and become like little miniature pearls of gelatin. They remind me of tapioca. They are high in both soluble and non-soluble fibers and hence aid digestion. Since this food contains no gluten, they make a good staple food for those with celiac or who have gluten sensitivity. My colleague Anca Marinescu, L.Ac., shared with me this delicious recipe for Vegan Chia Pudding. From a Chinese dietary viewpoint, this pudding is a great Blood builder and will nourish Yin. It contains food that will help you support your circulatory system, strengthen your digestion, regulate your bowels, and support immunity. The spices warm and support the Spleen and will open and course the meridians while supporting the Kidneys. Go ahead, try this delicious and healthy dessert! Soak the Chia seeds in the almond milk for 2 hours or overnight. Soak the raw cashews in water for 2 hours and discard liquid. Serve garnished with more coconut flakes and a sprinkle of pumpkin spice or try a garnish of fresh fruits or nuts.. This recipe is from Cook’s Illustrated magazine’s All-Time Best Recipes issue. I modified a couple of things as noted. It is delicious. If you have never checked out Cook’s Illustrated magazine, I highly recommend it. They discuss the scientific reasons for cooking technique and also use feedback from taste testers. 1 (14.5 ounce) can of diced tomatoes, drained. 8 slices country white bread (I substituted home-made gluten free bread, natch), 1 1/4 inches thick, broiled until golden brown on both sides. 2. Adjust oven rack to lower-middle shelf and preheat oven to 250 degrees. Heat oil and pancetta in Dutch oven over medium heat. Cook, stirring occasionally, until pancetta is lightly browned and fat has rendered, 6 to 10 minutes. 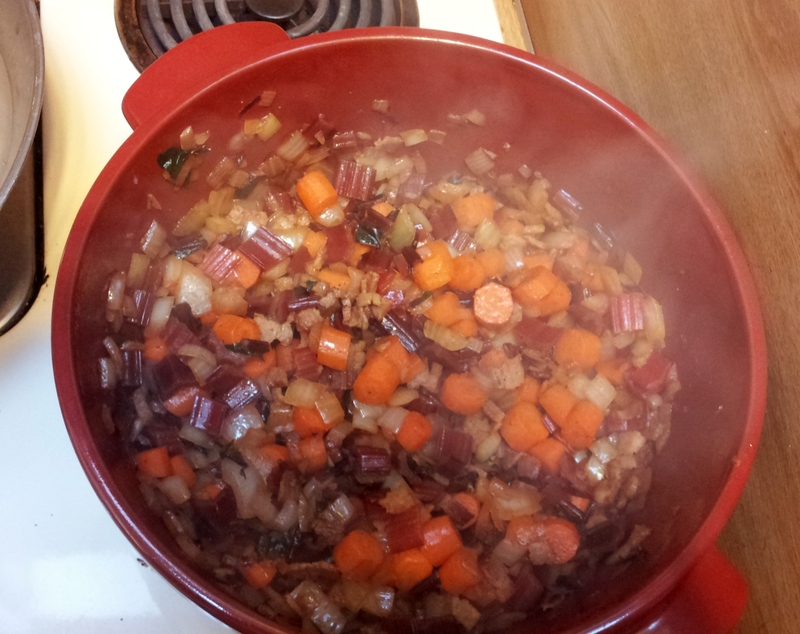 Add onion, carrots, and celery (or chard stem pieces) and cook, stirring occasionally, until vegetables are softened and lightly browned, about 10-16 minutes. Stir in garlic and cook until fragrant, 1-2 minutes. Stir in broth, water, bay leaves, and soaked beans. Increase heat to high and bring to simmer. Cover pot, transfer to oven, and cook until beans are almost tender (very center of beans will still be firm), 45 minutes to 1 hour. 3. Remove pot from oven and stir in kale and tomatoes. 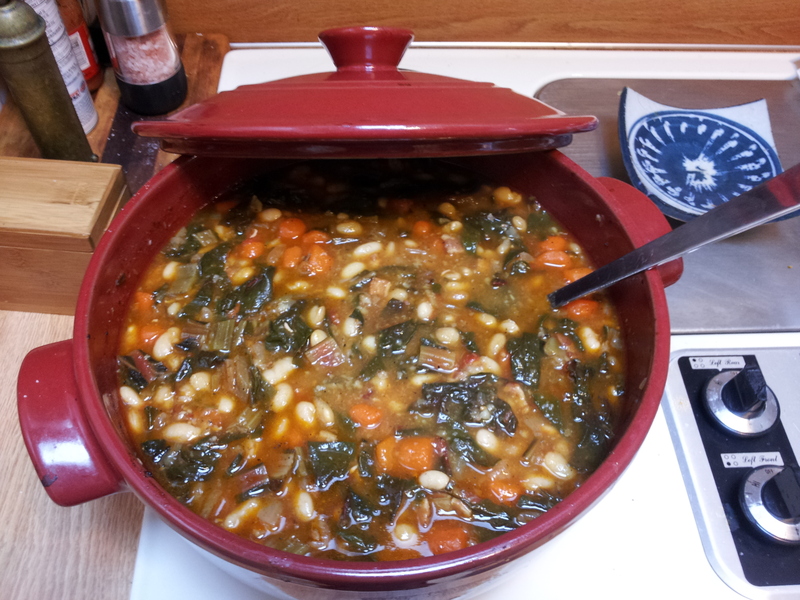 Return to oven and cook until beans are greens are fully tender, 30 to 40 minutes longer. 4. Remove pot from oven and submerge rosemary in stew. Cover and let stand for 15 minutes. Remove bay leaves an rosemary and season with salt and pepper to taste. Serve over toasted bread, if desired, and drizzle with olive oil. The veggies after cooking. Chard is so pretty. This recipe is adapted from Eating Well Magazine. My daughter loved it and ate 2 1/2 servings. Then she ate another serving the following day for breakfast.